Internet is one of the best technologies in today’s modern world. With Internet, we have successfully connected all our devices with each other as well as with the world. There are many uses of the internet like banking, social networking, entertainment, education, marketing and many more. The possibilities are endless. Here we are going to focus on one of the most used offering of the internet, and that is downloading. We all download files off the internet. May it be files, music, videos, software, application, movies or anything, we need to download data from the internet on our windows PC at some point. Hence, we are going to discuss about the best download manager for windows PC in this article. Any internet user is aware of the fact that downloading data can be a pain. There are many hiccups in the way out of which are slow speeds, errors, waiting times. To your rescue, there are various download manager software for windows PC that you can use. These download manager for PC offer high speed downloads, multiple downloads, scheduling and many more features for all your download needs. List Of Best Download Manager For Windows. 6. FDM – Free Download Manager. IDM has always been the best download manager for windows PC. It offers the best features and the fastest speeds. IDM can be considered one of the most reliable download manager. We already shared few tricks to increase idm speed. The only thing is it is a paid tool. But we tell you it is worth every penny. Another great downloader for windows PC is the JDownloader. The program is an open source software made in Java. It has all the basic functionality of any good download manager but a unique thing is that it generates a new IP once the download limit is crossed on some servers. Orbit Downloader is the third best download manager for windows PC. It offers a complete package with automatic downloads from YouTube, Pandora, and many more sites. It also supports file hosting sites as well as many other protocols like https, FTP, MMS and more. Just like the name, download ninja is a sneaky download manager that sits as an extension in the Google Chrome browser to take over all the downloads and make them smooth and dependable. Our next tool comes form the creator of Windows itself. Microsoft Download Manager is a minimalistic download manager available for windows 7, 8 and 10. It is a light weight app of about 2MB but is sufficient for the job. FDM is another great download manager for windows. It uses most of the IDM techniques to make downloads more reliable and fast but the best part is that it is free to use. There is also a Torrent client built-in which is a great deal. Next we have a yet another great download manager for windows. Download accelerator plus is a great option as it used a dynamic engine that supports multiple sources to increase download speeds. Users can even download content from YouTube and convert video to MP3 right there. There is also a premium version that offers a few extra perks. 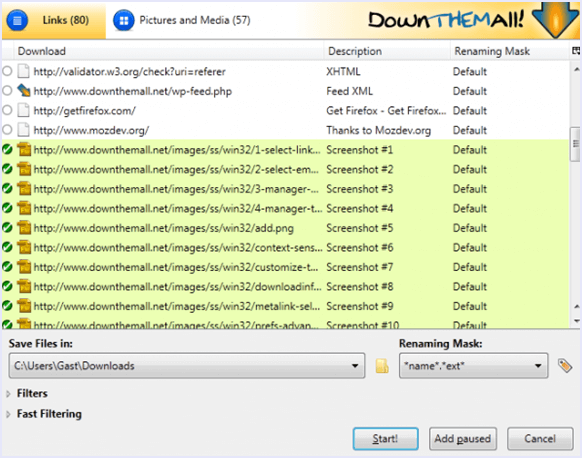 If you are a Mozilla Firefox user, and are looking for a way to enhance your download experience, give Down ThemAll a try. It is an extension that improves downloading on Firefox to a great extent. iGetter is a Mac download manager but it can also be used on windows PC. This tool can be used to schedule downloads and find Mirrors. Also it offers all the basic functionality of a download manager like acceleration, pause, resume, etc. GetRight is one of the oldest download managers but it has been continuously updated and still performs upto the mark. It supports all the browsers and works smoothly for direct as well as torrent downloads. Hence, these are the best download managers for windows PC. In conclusion, we hope that you find this list of best download manager for windows PC useful. If you feel we missed your favourite one, feel free to share with us in comments below. Also, if you have any query or suggestions, contact us.